Lafayette Caregiver of the Year! 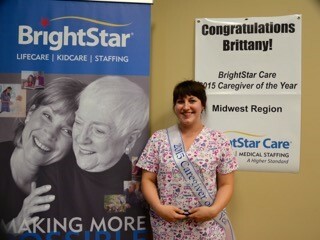 Last week, your local home care agency in Lafayette hosted a special celebration to share the great news that Brittany Buchanan was nominated for and chosen as the 2015 Midwest Region Finalist for BrightStar Care’s Caregiver of the Year award for the exceptional care she provided to BrightStar Care client Bonnie DeVore. “She laughed with me, hugged me, kissed me, cried with me, prayed with me,” DeVore said of why she nominated Buchanan. At BrightStar Care®, hundreds of stories like these come pouring in from across the country about special caregivers who have made a difference in the lives of those in their care. Families submit these stories to nominate a deserving caregiver for BrightStar Care’s annual Caregiver of the Year award. 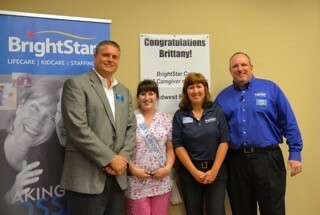 As a national finalist, Brittany will not only receive a $500 American Express gift card, but she and a guest will also depart on an all-expenses-paid trip to BrightStar Care’s Annual Conference at the Gaylord Opryland Resort on October 14-18. While in Nashville, Brittany and three other finalists will receive a spa treatment before attending the Awards Gala, where they will be recognized in front of all the BrightStar Care franchise owners. The National Caregiver of the Year winner will, then, be announced and awarded a $5,000 scholarship to use to further their education. After a stroke, the Lafayette, Indiana resident was alone, living in an apartment and down on her luck. “I could barely walk,” DeVore said. “I had no visitors. I’d lost 50 pounds in three months. I didn’t want to eat.” DeVore’s daughters heard a radio commercial about BrightStar, and suggested their mom set up an interview. DeVore said her daughters don’t believe in signs from God, but that didn’t stop her from believing in a higher power once she was introduced to 2015 Caregiver of the Year candidate Brittany Buchanan. Buchanan became DeVore’s best friend, helping her every step of the way in her recovery. The two were inseparable, and suddenly DeVore found a purpose again. “Brittany got me to eat by just sitting to talk with me as I ate. No matter how cold outside, no matter how deep the snow, I knew Brittany would be there and she was.” Brittany helped DeVore find a pet online, cleaned the house, kept her on schedule with her medication, and joined her for doctor appointments. DeVore she lived in a dangerous apartment complex, where Buchanan moved all of her stuff in and made it feel like home. Only three months later, DeVore moved to the “good side of town,” and Buchanan didn’t hesitate to repack everything, move it over start all over. “I know where it all goes this time,” Buchanan said, laughing to DeVore. Congratulations on this wonderful accomplishment, Brittany!